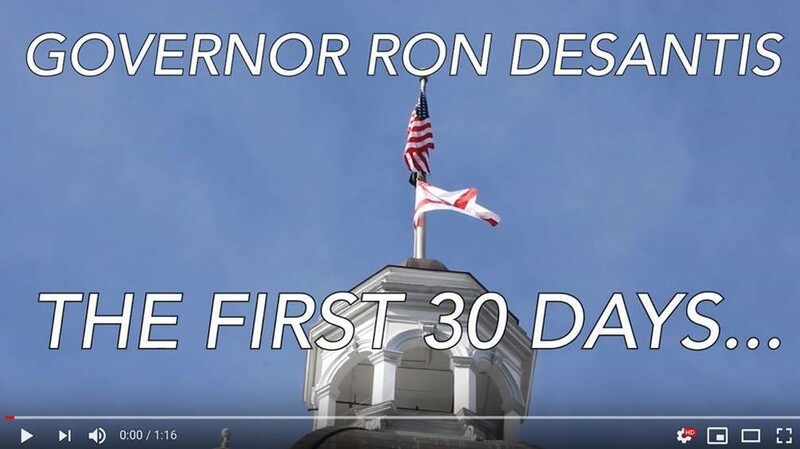 Tallahassee, Fla. – Today, Governor Ron DeSantis marks his 30th day in office that is exemplified by a fast-paced but purposeful schedule. Holding more than 30 events and an equally high number of press briefings across the state, Governor DeSantis recognizes that there is still more work to be done for the people of Florida. Below are highlights of the Governor’s time in office thus far. To watch the video, click the image or click HERE. Following the devastation left behind by Hurricane Michael, Governor DeSantis has made recovery a top priority of his administration. His first full official day in office was spent in Mexico Beach to emphasize that he is committed to aiding recovery efforts. Since then, he has made multiple additional visits to the Panhandle, announced $2.8 million in state matching funds and has met one-on-one with President Trump to secure 45 days of 100% reimbursement for hurricane recovery efforts. The environment is a major part of what makes Florida, Florida. That is why Governor DeSantis has made the environment an early priority. In his recently released proposed budget, Governor DeSantis recommends investing $625 million for Everglades Restoration and protection of water resources. By investing this amount each year, $2.5 billion will be invested by the end of his first term, which is $1 billion more than what was invested the previous four years. $360 million would be specifically dedicated to Everglades restoration, allowing Florida to complete the C-44 Reservoir and storm water treatment area, the C-43 Reservoir and an additional 20 projects over the next five years. He also signed an Executive Order calling for the formation of a Blue-Green Algae Task force, the appointment of a Chief Science Officer and the creation of the Office of Environmental Transparency. As promised during his inaugural address, Governor DeSantis made historic appointments to put an end to judicial activism on the Florida Supreme Court. These appointments included Justices Barbara Lagoa, the first Cuban-American female Justice, Carlos Muñiz, the first Nicaraguan-American Justice and Robert Luck, the first Orthodox Jewish Justice. Governor DeSantis recently issued Executive Order 19-32, outlining a path for Florida to improve its education system by eliminating Common Core and paving the way for Florida students to receive a world-class education. Fulfilling a promise made during his campaign for governor, the Executive Order directs Florida Department of Education Commissioner Richard Corcoran to comprehensively review and recommend revisions to the academic standards for Florida’s kindergarten through grade twelve students. Included in Governor DeSantis’ proposed budget is a nearly $19 million investment to fund the waitlist for Gardiner Scholarships in Florida. Each student has their own unique needs, and the Gardiner Scholarship Program provides eligible students a scholarship that can be used to purchase approved services or products to design a customized education program for the student. Funding the Gardiner Scholarship waitlist would cover nearly 2,000 students with special needs. In his second week in office, Governor DeSantis issued a full pardon of the members of the Groveland Four, which was unanimously approved by the Executive Clemency Board. For seventy years, the histories of Ernest Thomas, Samuel Shepherd, Walter Irvin and Charles Greenlee have been wrongly written for crimes they did not commit. Governor DeSantis believes it is never too late to do the right thing. Governor DeSantis condemns all discrimination. Airbnb has a policy that commercially discriminates against the Jewish people and the State of Israel. Governor DeSantis accepted the State Board of Administration’s recommendation to place Airbnb on the Scrutinized Companies List. Further, the Governor announced his support for $2 million in recurring security funding for Jewish Day Schools. He also announced that his first international trip as Governor will be a trade mission to the State of Israel. Governor DeSantis has made it a priority to suspend officials who are negligent and incompetent. Since taking office, he has ordered the suspensions of Okaloosa County Superintendent of Schools Mary Beth Jackson, Broward County Sheriff Scott Israel and Palm Beach County Supervisor of Elections Susan Bucher and has appointed successors who will bring competency and dignity back to the respective offices. In addition, he requested the resignations of all South Florida Water Management District board members, all of whom have either adhered to the Governor’s request to resign or plan to. The Governor has appointed Chauncey Goss and intends to appoint “Alligator Ron” Bergeron to the board. To ensure a brighter future for Florida’s economy, Governor DeSantis recently kicked off a one-day event called “Florida Deregathon” to find solutions to harmful regulations facing Floridians. Hosted by Lieutenant Governor Jeanette Nuñez and Florida Department of Business and Professional Regulation Secretary Halsey Beshears, along with Florida’s Professional Licensing Boards, Florida Deregathon was a success as numerous burdensome regulations were identified. Governor DeSantis feels that the current medical marijuana legislation is not in line with the will of the more than 70% of Florida voters who supported it in 2016 via a constitutional amendment. Because of this, he has called on legislators to provide a solution to People United for Medical Marijuana v. Department of Health within the first two weeks of the upcoming legislative session. If a solution is not reached, the Governor will drop the state’s appeal and the lower court ruling, stating a ban on smoking medical marijuana is unconstitutional, would stand. Governor DeSantis’ Bold Vision for a Brighter Future budget amounts to a total of $91.3 billion, including $335 million in tax cuts for Florida families. The proposal also includes the continuation of the highly successful 3-day back-to-school sales tax holiday, as well as the weeklong disaster preparedness sales tax holiday, for a total tax cut of $45.3 million. It also sets aside $5.2 billion in reserves, including $1.6 billion in the Budget Stabilization Fund. Standing alongside Vice President Mike Pence, Governor DeSantis declared his support for democracy in Venezuela, issuing a proclamation recognizing Interim President Juan Guaidó as the only legitimate leader in Venezuela and standing against Nicolás Maduro’s oppressive regime. The proclamation affirms Florida’s deep affection for the Venezuelan people and decries the individual liberties that have been stripped from them. The Governor also called on the Florida Legislature to act swiftly during the 2019 legislative session to follow suit in recognizing Juan Guaidó as the Interim President of Venezuela. Governor DeSantis has accomplished much in his first 30 days in office. Stay tuned.